with a 5 star average rating for value, puncuality, and work quality based upon 45 reviews. 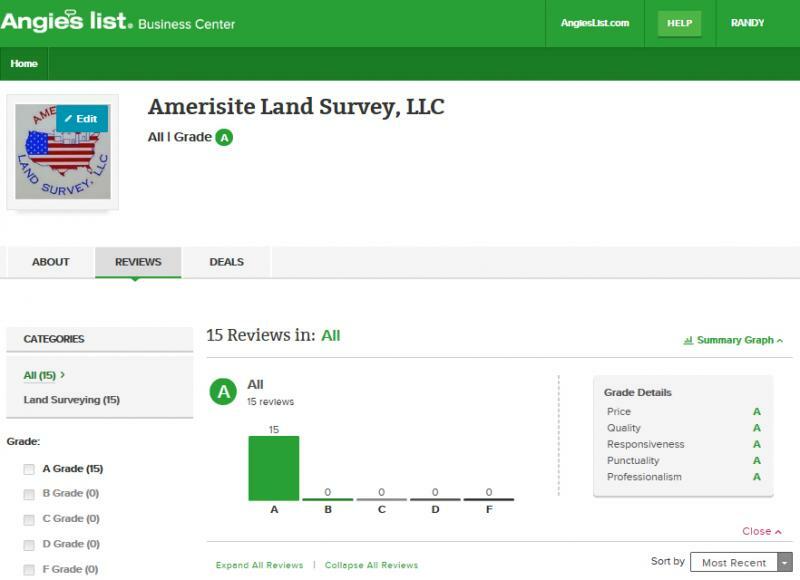 Angie's list gave Amerisite Land Survey, LLC an "A" average rating in all 5 categories for price, quality, responsiveness, punctuality, and professionalism based upon 15 reviews. 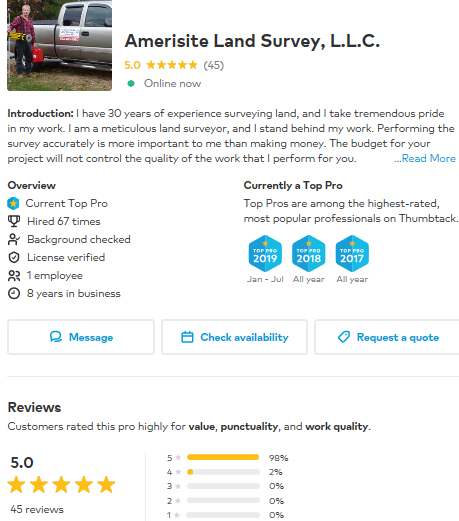 Home Advisor.com gave Amerisite Land Survey, LLC a 5 star average rating for price, customer service, and value for money based upon 9 reviews. 5 stars June 5, 2018 Randy did a great job for our project. He was responsive and exceptionally dedicated to finishing/completing the project for us in the short time frame provided. Impressive especially since he ran into some obstacles with incorrect information on original plans. I highly recommend. Patricia F.
5 stars October 23, 2018 Randy Donckers of Amerisite Land Survey is the person to call if you are in need of finding your boundaries. He can accommodate partial or complete surveys at the most reasonable prices. His experience is wide ranging and I am sure Randy can calculate most any situation. I would recommend this company to anyone. Chris N.
5 stars October 26, 2018 Randy was extremely easy to talk with and he was very accommodating with my request. He said what he was going to do and when he was going to do it, and he did it! Brian H.
5 stars October 12, 2018 Randy was very professional. He responded to all inquiries rapidly. He showed up when he said he would. Would definitely recommend him. He did a great job!! Debra F.
5 stars May 22, 2018 I hired Randy to do a land survey on my property for some planned new construction. He was very professional and thorough in his work and he understood the needs of my project. Thank you for fitting my project into your workload and we couldn't be happier with the results. You should hire Randy.....I'm glad I did! James T.
5 stars June 30, 2014 Randy was there in a very timely manner, very professional, provided excellent service and did exactly what I needed and more. He gave me a really great deal as well. Norman L.
5 stars September 6, 2013 VERY PROFESSIONAL, KNOWLEDGABLE, AND RELIABLE. COULD NOT HAVE ASKED FOR BETTER SERVICE. THANK YOU. Edward C.
5 stars July 20, 2013 Excellent service, fast and accurate survey. We were very pleased William M.
5 stars April 27, 2013 Pressional and pleasant. Responded in a timely manner. Documents were professional and clear. Jody P.
5 stars April 27, 2013 Hi, I recently purchased a foreclosed house in Candia NH with 16 acres of which 14 is heavily wooded. The properties deed and the 6 abutter’s deeds are rather vague in their descriptions but I wanted to know where my property lines were. Randy identified the existing monumentation and flagged the property lines, almost 1 miles worth.In all I have enjoyed working with Randy, I was happy with the quotes for the work which were reasonably priced and clearly explained the work to be done. All of the work done was completed when he said it would be and there were no hidden fees or increases in prices quoted, which I have seen too often in the past. I’m looking forward to working with Randy on my septic design and my future surveying needs. Jim H.
5 stars March 6, 2013 I hired Randy to complete a site survey for the shoreline protection agency concerning an addition I was building. As well as a follow up after the foundation was poured. Randy was prompt, honest and very professional. He paid great attention to detail and was very resonable with pricing. I would recommend Randy for any services he provides as well as people he recommends to complete a service he does not provide. 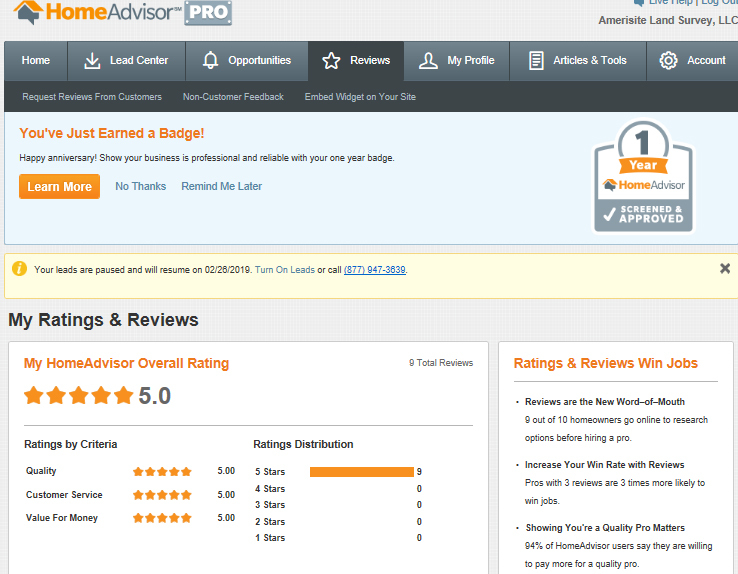 Chris L.
5 stars March 5, 2013 Randy did a speedy and precise job surveying my property in Massachusetts. He delivered as promised and his fees are very competitive. William A. 5 stars March 5, 2013 When we called Randy and asked him to come over to do the survey, he showed up quickly, didn't have to wait a long time. He was very detailed and took his time so we don't have to pay for flood insurance since the water was too far away. He was very friendly and I would recommend him to everyone that asks me for references. He's fast with returning calls or emails too! Daniel G.
5 stars August 20, 2012 He was very good and professional. Was good to deal with a contractor that kept his word about the time, cost, and when job would be completed. George R.
Professional land survey services with a smile!